Earlier this year developer Simogo released Year Walk, a narratively driven adventure game with a chilling atmosphere. Year Walk used iOS devices to great effect and created something genuinely unique for the platform, thoroughly engrossing players into a strange and terrifying world. Simogo recently released their newest game on iOS called Device 6 and people should most certainly play it. Device 6 plays with your expectations. It’s difficult to parse at times, with its strange, but compelling, narrative and head-scratching puzzles. It is told mostly through text, asking players to scroll through the story with a swipe of the finger. You follow the story of a woman named Anna, who wakes up on a strange island with no idea why she’s there. You’re tasked to solve puzzles and continue forward to figure out the mystery behind this island and Anna herself. What makes Device 6 so engaging is its presentation. It begins with an opening credits sequence reminiscent of James Bond movies, as slick 60’s style silhouettes and paper cut-outs move across the screen to a lighthearted jazz song. 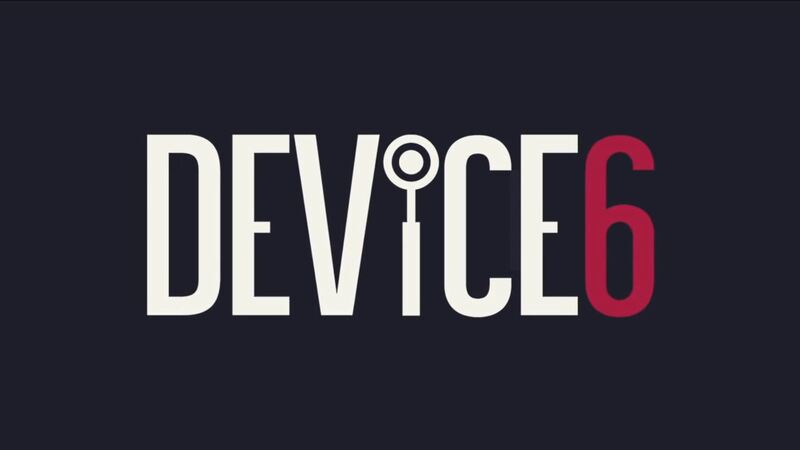 You’re unsure what you’re getting yourself into, and Device 6 holds everything close to its chest. You’ll have to poke and prod at the dense storytelling to fully make sense of it, leaving questions up to the last second. As you move through the story, and by extension Anna moves through the various environments she finds herself in, you’ll turn your iOS device to match her movements. If she makes a left turn to go into a new hallway, you will also turn your iOS device left, since the text will shift that 90 degrees she did to make the turn. As Anna walks up stairs, the text will begin climbing up the length of your screen. It’s a unique and clever way to connect the player to the character in a mostly text-oriented story. In each of the six chapters you’ll have to solve a variety of puzzles — and they aren’t easy either. They range from remembering small details from earlier in the chapter, or connecting logical dots between the most illogical of things. 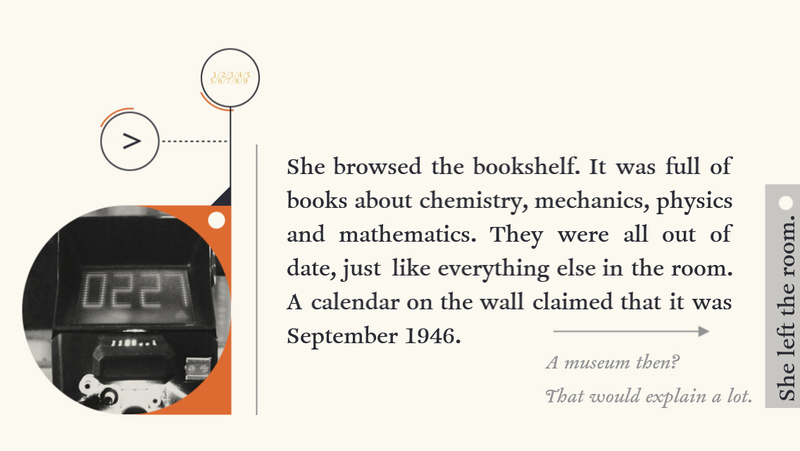 For example, the first puzzle starts with the most perplexing of clues: “A simple math problem: A framed number, in the room where red meets yellow + Another number, between hope and lies + The channel am I on.” You suddenly find yourself swiping back and forth through the chapter, reading and re-reading text for hints you may have missed, or a photo you passed over too quickly before, which then forces you to twist and turn your iOS device in all manner of directions, possibly to dizzying effects. None of the puzzles are easily solved at a first glance, they’re challenging enough to make you scratch your head just long enough for the magical “ah-ha!” moment where you figure it out and feel incredibly good about how smart you are. As Device 6 continues its spiral towards madness, you’re left to ponder the nature of the narrative and whether or not you have an effect on anything. Are you playing as Anna going through the story, or are you reading an account of what Anna has done and just following in her footsteps? Are you an active agent in the story, following Anna, or something else entirely? The questions are asked early on, and not answered until seconds before the end. Clues to the larger narrative are placed throughout the chapters, but none of them quite make sense unless you’re keeping notes. And you will most likely keep notes. Device 6 is the first game since Fez where I found myself writing down large amounts of information so I could better solve the intricate puzzles. I didn’t have near as many notes as I had for Fez (which took up the entirety of my desk), but I filled out about six 3×5 index cards worth of material, some necessary, some not, some random theories, and other casual observations. Nothing about Device 6 would work if the narrative weren’t compelling down to the final moments. The story itself is well told and the writing (save for probably one typo I noticed in the entire game) was engaging and charismatic. This is all highlighted by the hums of old electronics and various footsteps heard as Anna moves throughout the island. Music lingers in the background until Anna is spatially far enough away where she would no longer hear it. All of this atmosphere, from the writing to the sound, is enhanced further by various black and white photos placed intermittently to help you understand where Anna is and what she’s looking at. The atmosphere itself changes with each chapter, wherein one will feel claustrophobic, isolated, and creepy, while another feels open and mysterious. Unlike most games on iOS devices where you’ll pick them up and play for a few minutes while waiting for something, Device 6 is one of those games that grabs your attention for the few hours it lasts and doesn’t let go until the credits start rolling. It questions your perceptions of itself constantly and stumps you with difficult, but satisfying puzzles. It tells a unique story in a unique way, and I recommend it to anyone with an iOS device and a few hours of your undivided attention.